Eureka Springs is the perfect place to celebrate a calm and relaxing Thanksgiving weekend with your nearest and dearest. The quaint Victorian town opens its doors to everyone on Thanksgiving! 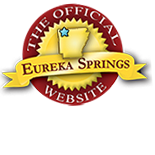 If you are looking for a small, hassle free getaway, Eureka Springs is the place to be! Check out this sample itinerary for a great Thanksgiving Vacation. Who wants to spend the whole holiday cooking? Stop by the 1886 Crescent Hotel for a traditional Thanksgiving Feast! Come enjoy a home for the holiday’s Thanksgiving Day Feast. Breakfast served from 8am-10am, Thanksgiving Feast served from 11am-4pm (reservations required) and a Thanksgiving Special offered in the Sky Bar from 3:30pm-10pm. Click here for a full menu. Avoid the hustle and bustle of Black Friday and spend a quiet day exploring the trails and footpaths of Eureka Springs. After the sun sets, drive out to the Great Passion play to view the beautiful Christmas Lights, the best in the Ozarks! Eureka Springs is home to an amazing array of small boutiques and galleries. You are sure to find something for everyone in one of our amazing stores situated in charming Downtown Eureka Springs. Shop Small Business Saturday on November 25th and help support these amazing, locally owned small businesses! While in the Ozarks, stop by what many have called one of the most beautiful and inspiring chapels in the world. It will be a visit you will not soon forget. Just west of Eureka Springs on Highway 62 is the beautiful Thorncrown Chapel. Sunday service at 11:00 AM. Services last approximately one hour and include inspiring music and biblically based preaching. All people are welcome. This entry was posted on November 2, 2017 by service424 in Attractions, Crescent Hotel, Culinary Adventures, Family Fun, Festivals, History, Things to Do and tagged Crescent Hotel, downtown eureka springs, Great Passion Play, Thanksgiving, thanksgiving vacation, Thorncrown Chapel.